This article is a short summary of Donkey Kong Land 2. Donkey Kong Land 2 is a video game released for the Game Boy in 1996. It was developed by Rare and published by Nintendo. 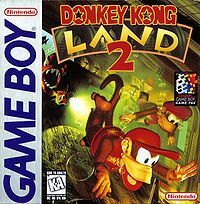 The game was released as the sequel to Donkey Kong Land and is essentially a remake of Donkey Kong Country 2: Diddy's Kong Quest. Kaptain K. Rool has kidnapped Donkey Kong away from Donkey Kong Island. It is up to Diddy Kong and Dixie Kong to save Donkey Kong. It should be noted that the storyline of this game is essentially a trimmed down version of the story of Donkey Kong Country 2: Diddy's Kong Quest. This page was last edited on 13 October 2018, at 23:09.